Šiauliai is the fourth-largest city in Lithuania. In 2016 about 102,000 people lived in the city. 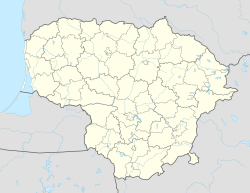 From 1994 to 2010 it was the capital of Šiauliai County. Wikimedia Commons has media related to Šiauliai. This page was last changed on 21 December 2017, at 13:30.